MELBOURNE, Australia -- Tens of thousands of Melbourne homes and businesses lost power for up to two hours Friday as air-conditioners taxed the power supply on what was the hottest day in five years for Australia's second-largest city. The Victoria state capital, with a population of 5 million, was earlier expected to reach 44 degrees Celsius (111 degrees Fahrenheit), the highest in a decade. Melbourne peaked at 46.4 C (115.5 F) on Feb. 7, 2009 -- a day of catastrophic wildfires that killed 173 people and razed more than 2,000 homes in Victoria that is remembered as Black Saturday. It had been the hottest day recorded by a major Australian city until Adelaide reached a searing 46.6 C (115.9 F) on Thursday. Melbourne reached 42 .8 C (109 F) by the early afternoon before a cool change quickly drove the mercury down. That was the hottest day in the city since Jan. 17, 2014, when the maximum tipped 43.9 C (111 F). But Melbourne's outskirts were hotter on Friday, with the airport recording 46 C (114.8 F). The grid began load sharing as temperatures climbed in the early afternoon, with 30,000 households and businesses at a time being switched off for as long as two hours so that supply could keep up with demand. But the cool change arrived less than two hours later. Victoria Energy Minister Lily D'Ambrosio said that by late afternoon, the state's power generation could meet demand. "The situation changed very, very quickly," she told reporters. "People should be rightly disappointed that the power grid was not up to the task today." Adelaide, the South Australia state capital of 1.3 million people, 640 kilometres (400 miles) west of Melbourne, on Thursday beat its previous 80-year-old record of 46.1 C (115 F), and records tumbled in smaller towns across the state. The South Australian town of Port Augusta, population 15,000, topped the state at 49.5 C (121.1 F). The Australian Open tennis tournament in Melbourne invoked its extreme-heat policy on Thursday and closed the main stadium's roof during a women's semifinal match. Bureau of Meteorology forecaster Rob Sharpe said he would not be surprised if this January becomes Australia's hottest January on record with heatwave conditions likely to persist. 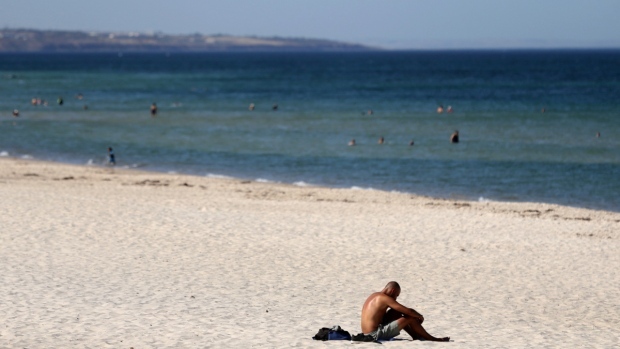 Last year was Australia's third-warmest on record.